Crystal Clear Pockets: Designed to see the content easily. 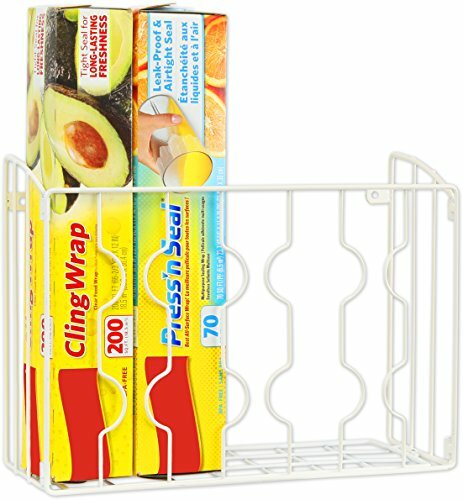 SimpleHouseware Wall Mount Wrap Rack is a organizer for your kitchen storage to organize your food wrap, aluminum foil. and wax paper rolls. Showcase your beauty! Put your polishes and other beauty essentials on display. If you're looking for a decorative way to showcase your bottles and beauty must-haves, you've come to the right place. 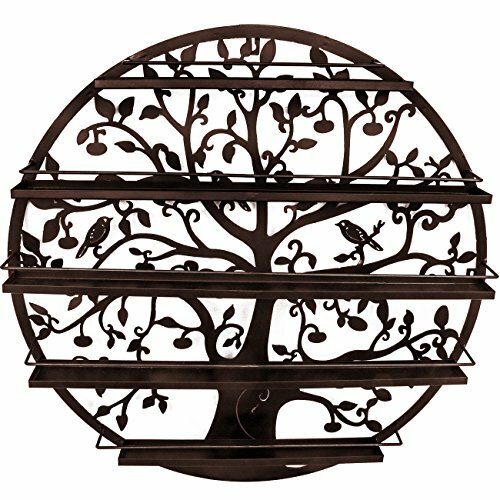 This 5 tiered rack, featuring an intricate Bird and Tree silhouette is the ultimate nail polish holder to display style and organization to your wall of choice. Since there is no standard size for nail polish bottles and each brand has their own signature shape, this nail polish rack is the perfect solution to accommodate an assortment of polish/lacquer sizes and brands. Popular retail brands such as O.P.I, Nicole, Ulta, Butter, China Glaze, plus many more can now be easily displayed in your nail collection. In addition to nail polish and laquers, store your acrylic supplies and feature this as an acrylic cosmetics holder. Free your drawer, counter, and cabinet space with a convenient wall display. Make life easy and simple with a convenient wall display and create functionality by easily finding your bottles when you need them. No more "caboodle" cases, individual cubbies for polish, stuffing bottles in bins under the sink, or using cheap plastic organizers. Unlike other inconvenient storage options, the bottles slide right in the nail polish organizer with ease. Easy to install in your home or place of business. Constructed of sturdy high quality metal with a classic black finish, this can be quickly installed. Simply hang or mount on to any wall with a nail using the one round installation hole located on the center back. Holds up to 70 nail polish bottles. Measures approximately 20.25" L x 2.25" W x 28" H. (Please note: nail polish bottles are NOT included). Also makes a great gift idea for any beauty lover, fashion blogger, or business owner! Has four compartments for holding aluminum foil, plastic wrap, sandwich bags, and other wraps. Keep all your wrap and foil boxes organized and out of sight. Gone are the days of shuffling through a cluttered pantry to find what you need. Or the frustration of not having enough space. 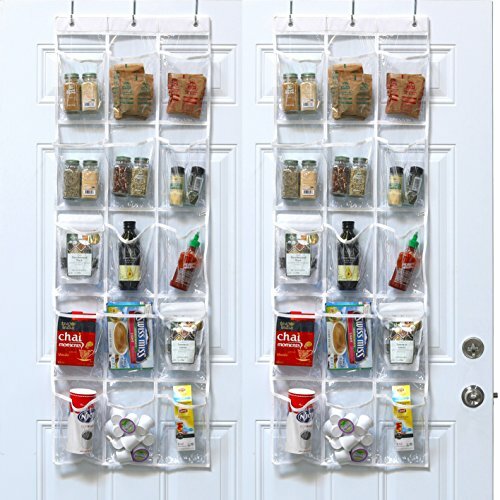 This five tier ADJUSTABLE pantry organizer provides additional storage by attaching to an interior door, making all your food and household essentials easily visible. It features two deep baskets to hold bulkier items, as well as slim baskets to holder lighter items. Each basket features an open concept to promote air-flow, allowing foods to breath and remain fresh longer. 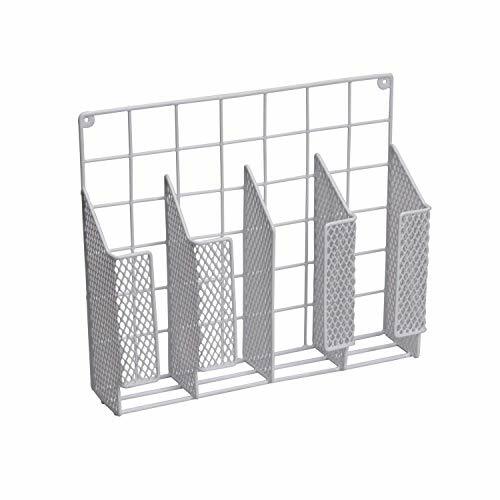 While primarily used in the kitchen, this over the door organizer is also great to use in the laundry, office, playroom, and more. And with no tools required to install, it's easier than ever to bring order and organizer to any room in the house. Wrap organizer equinox. Made in China. Highly durable. Adds shines to your sweet home. Easy to use. Perfect blend of comfort. 169306 Features: -Hands free operation. -Hold open storage bags while you pour. -Adjustable for most sizes of storage bags. 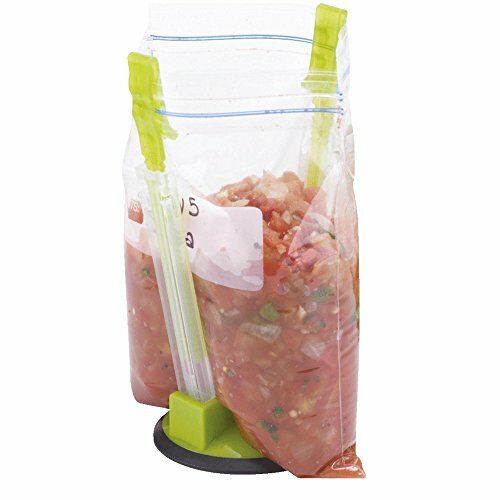 -Sandwich bags fasten under clips to hold open for filing. Color: -Green, Clear. Material: -Plastic. Dimensions: Overall Height - Top to Bottom: -11.1". Overall Product Weight: -0.16 lbs. Keep your home or office neat and organized with the Folding Storage Shelf by Lavish Home. 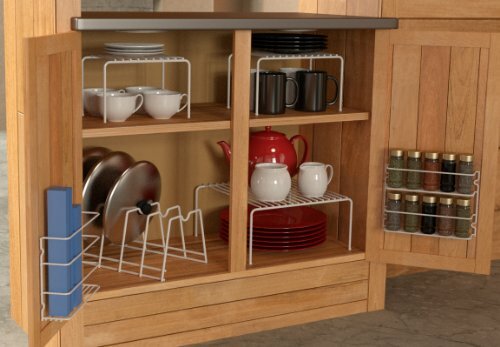 This single tiered shelf has a folding leg design to conveniently utilize vertical cabinet space, making it great to use in small homes and offices to maximize storage. The shelf is made of polypropylene plastic with a textured rubber lining and a . 75 raised lip to keep items securely in place. The metal legs feature rubber feet to keep the unit stable and fold into built-in holding clips for slim, convenient storage when not in use. 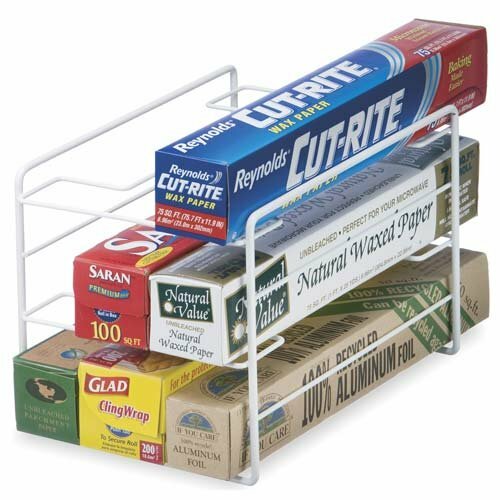 This shelf is ideal to use in your kitchen or pantry to organize spices or dishes, in bathrooms for beauty and healthcare items, and in lockers or offices for notepads and small supplies. SATISFACTION : Lavish Home is committed to providing the consumer with the absolute best price and value on all of our products, which we ensure by applying a rigorous quality control process. NOTE: This is an exclusive product of Lavish Home and ONLY Folding Storage Shelves by Lavish Home are to be genuine. IMPORTANT: Avoid buying counterfeit products and transacting with unauthorized sellers. Look for our logo on the packaging for every one of our products. Lavish Home is a registered trademark protected by U. S. Trademark law and will be vigorously defended. SPACE SAVING- This freestanding organizer shelf ideal for use in small homes and offices, small bathrooms and laundry rooms. 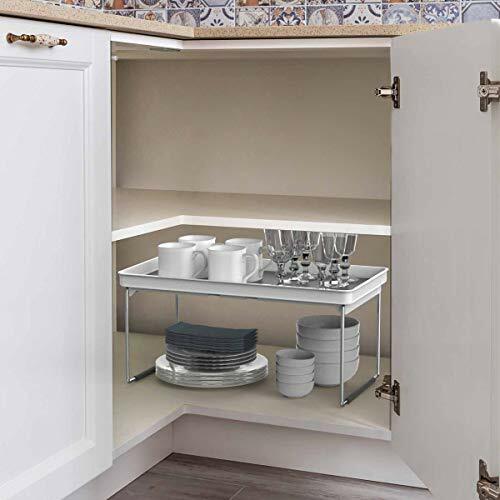 It utilizes vertical cabinet and counter space to maximize storage capabilities. FOLDING DESIGN- This plastic shelf features a foldable design. The metal legs snap into built-in holding clips for convenient, flat storage when not in use. The rubber feet help to keep the unit stable. 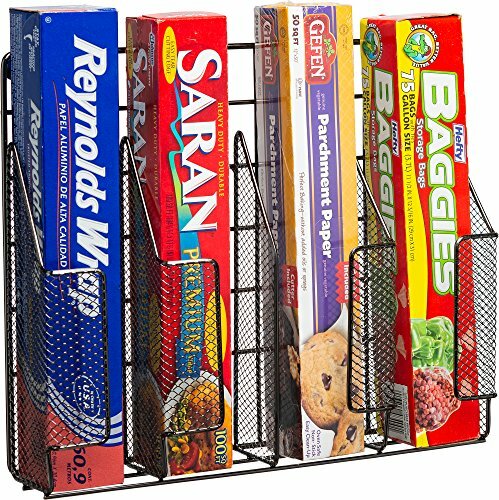 SAFE STORAGE- This folding organizer features a textured, rubber liner and . 75 raised lip. These help to keep spices, health and beauty items and small office supplies securely in place and within easy reach. 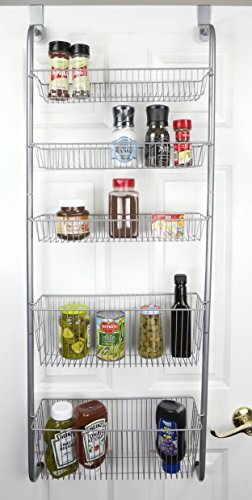 USE ANYWHERE- Not only is this shelf great to use in kitchens and pantries to organize spices and canned food, it can be used in a locker to hold notepads and writing supplies, in a closet, or even in the garage for tools and small parts. PRODUCT DETAILS- Materials: Metal, Polypropylene and Thermoplastic Rubber. Open Dimensions: 14. 25 L x 7. 5 W x 7 H. Folded Dimensions: 14. 25 L x 7. 5 W x 1. 5 H. Raised Lip: . 75 H. Color: White and Gray. 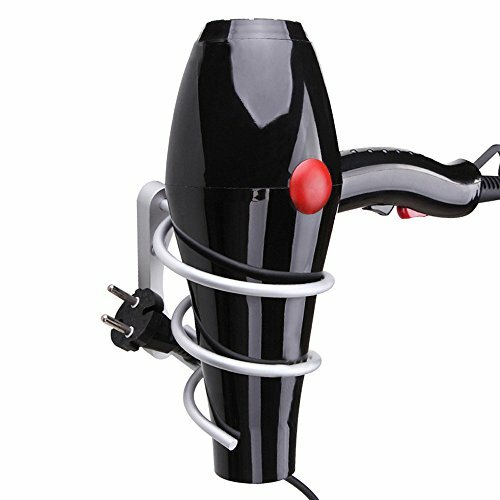 The rack is for small and portable hair dryer. Easily and conveniently holds up to nine boxed wraps. Can be stored in a pantry, cupboard, or large kitchen drawer. Top shelf is ideal for holding other boxed items like snack and sandwich bags. Sturdy wire design makes it easy to insert boxes as well as take them out.